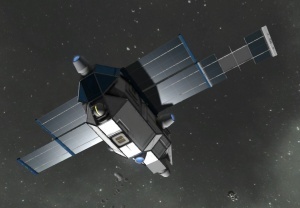 A relatively fast, solar powered cargo ship with 2 interior turrets for defence but no booby traps. This ship has 2 interior turrets mounted behind the side thrusters. They only have 5 magazines of ammunition, so they are likely to very quickly deplete their ammunition on approach. The specific antenna that spawns drones has a range of 191 meters and is named: "EMERGENCY - REQUESTING ASSISTANCE". This antenna within range will spawn a Assailant drone in defense, at 3000 meters away from the player and every 5 minutes up to a total number of 3 drones active any time. Approach from directly in front so that the side thrusters block the turrets. You will need to disable them before you can get to the door easily. Disable the turrets via the conveyor ports on the Large Cargo Container. To get inside you have to cut down catwalk from above rear thruster. The large cargo container is accessible from the ship sides. As of v.1.045 (list), the game changes have made the Private Sail harder to capture, and slightly more valuable. The ship has gained two interior turrets, three batteries and an Antenna. This page was last modified on 11 November 2015, at 08:40.